The plan for tonight includes camping! We bought a tent a few months back, with the intention of trying this whole camping thing. I haven’t camped in years, and neither has Quinn. The girls think it is super cool and romantic and cannot WAIT to try it out. The summer is nearing its end, and we haven’t done it yet. 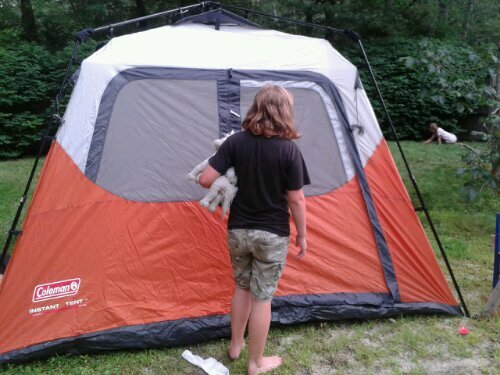 We checked the weather, took out the tent, and put it up. As we’re doing this, we feel a couple of little sprinkles, more of a mist, but nothing big. There was nothing on the radar, and there is lovely blue sky above us. Nothing to worry about, right? Right. The tent was set up. The kids put their blankets and toys in there. I have all the windows open to keep it nice and cool. Suddenly, the sky opens out of nowhere! I managed to get teh windows zipped up before the real rain started, and came inside (not sitting in an untried tent in a downpour). 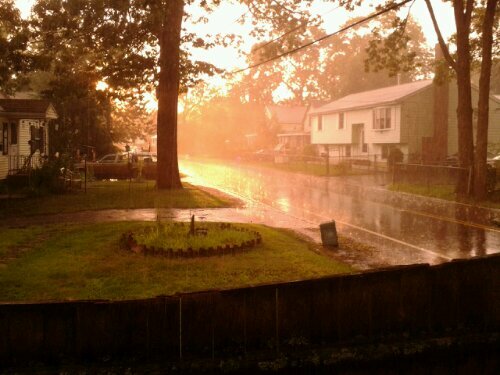 The view down the street was beautiful, with the sun shining brightly through the downpour. I have been informed that there is now water in the tent from their feet. Yay. So I get to sleep in a muddy tent. Oh, well. Its camping, right? What’s camping with out a little mud? At least I don’t need to go out there until dark-time. I’m already having fun, can you tell?